Are you a real traveler? Someone, who likes to catch another view of a place than the one seen through the eyes of million whatsoever people? 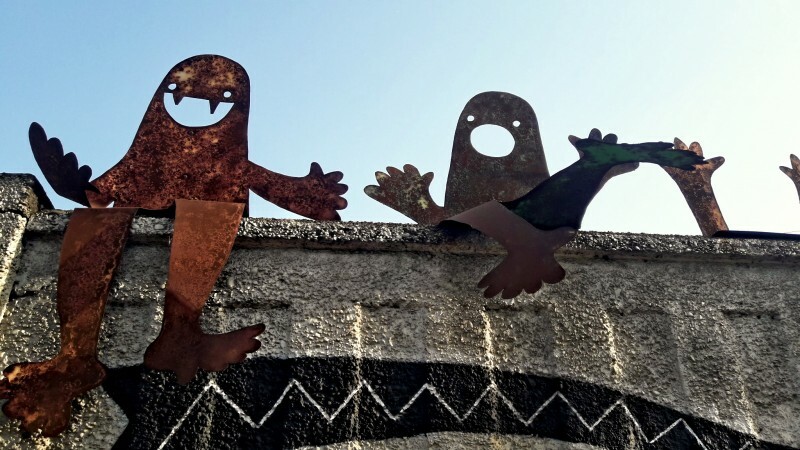 Do you like to combine cultural city trips with relaxing beach time and alternative tours of abandoned or untouched parts? 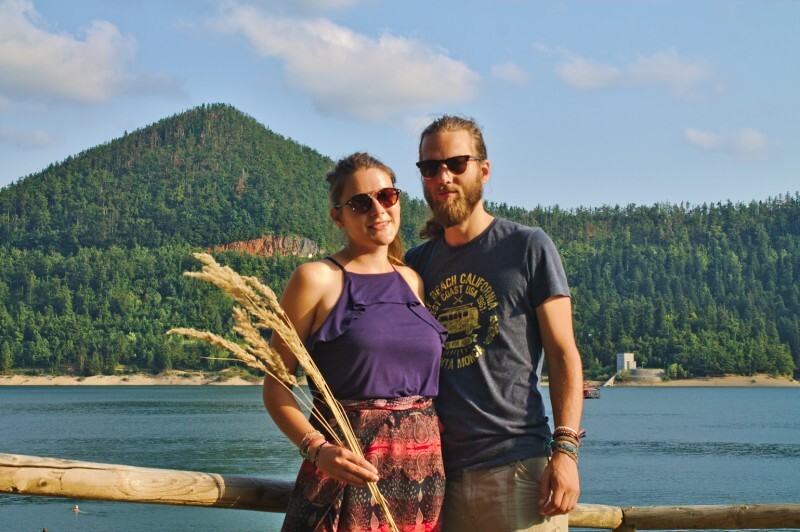 Are you traveling on a budget and would do anything to change your plans or rethink your ideas of how you use to explore a country if you can spend less and see more? 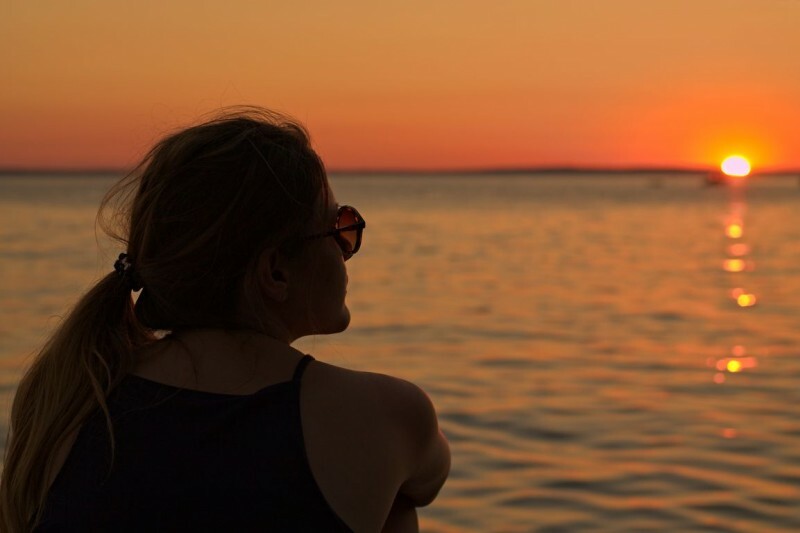 If you find yourself in these questions, we can promise to keep up with your expectations and present you Croatia’s coast in a way nobody did before including exclusive information on wild camping and information on places which might be not on your radar. 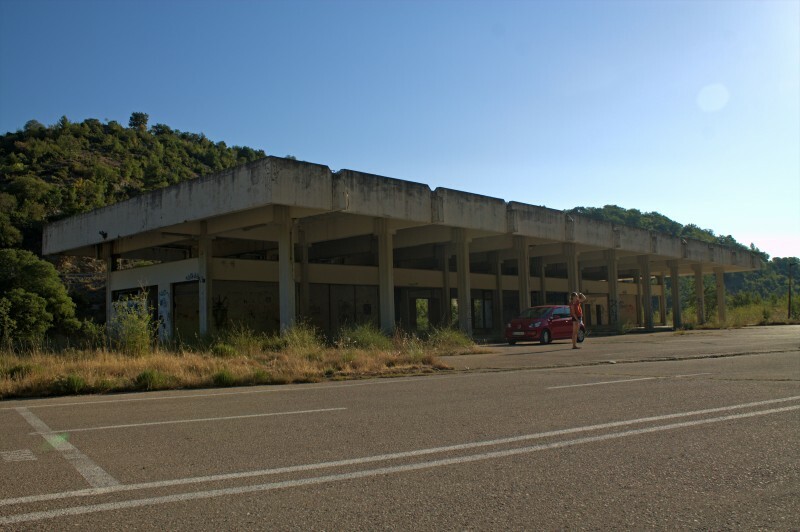 Rent a car in Croatia and you will get to see barely visited places. Rolling wheels, reliable navigation and strong bones. Translated: rent a car (we got a good price at Active Rent), download offline Google Maps and never forget to stretch your limbs after a night in the car! We won’t mention any of Croatia’s islands although they definitely add to the charm of this country. However, this is a Budget Guide and the truth about island hopping is, that it will leave a big hole in your wallet! 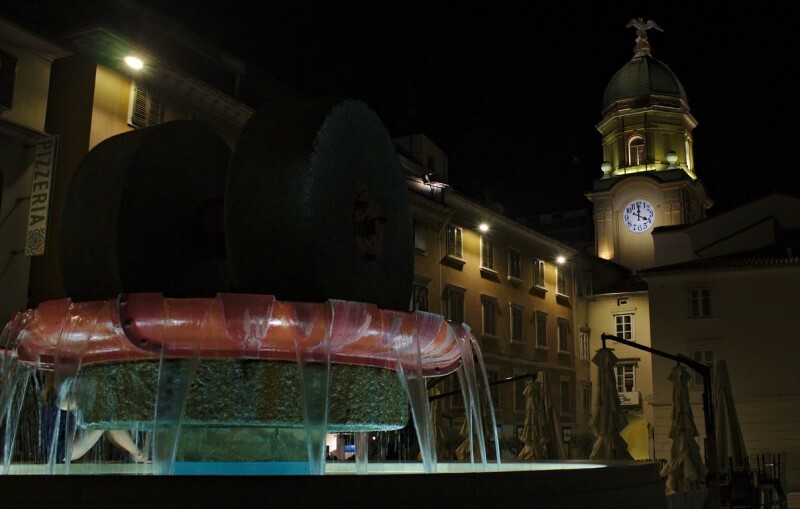 This Travel Guide follows the story of our road adventure along the Croatian coastline (Jadranska Magistrala), starting in Rijeka and ending in Šibenik. 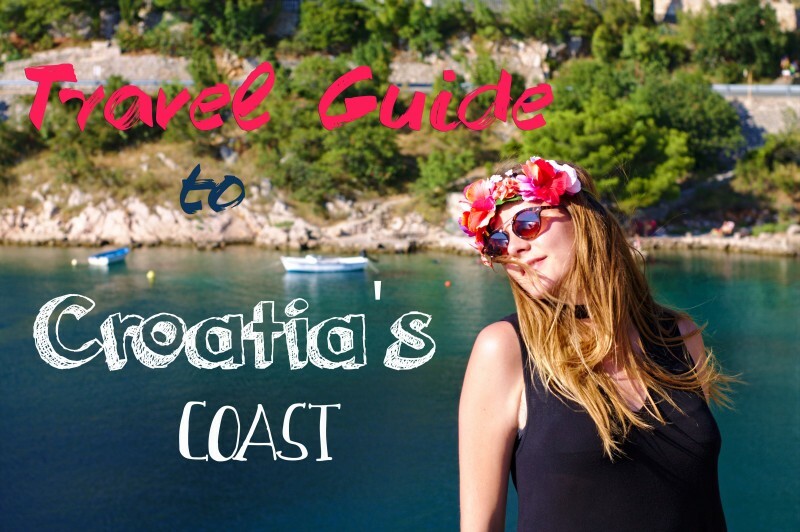 We skipped the big tourist destinations like Split, Zadar and Dubrovnik on purpose because this is a Budget Travel Guide for savvy backpackers like us, who are additionally looking for places within the famous coast of Croatia that are still unexplored and suitable for wild camping. 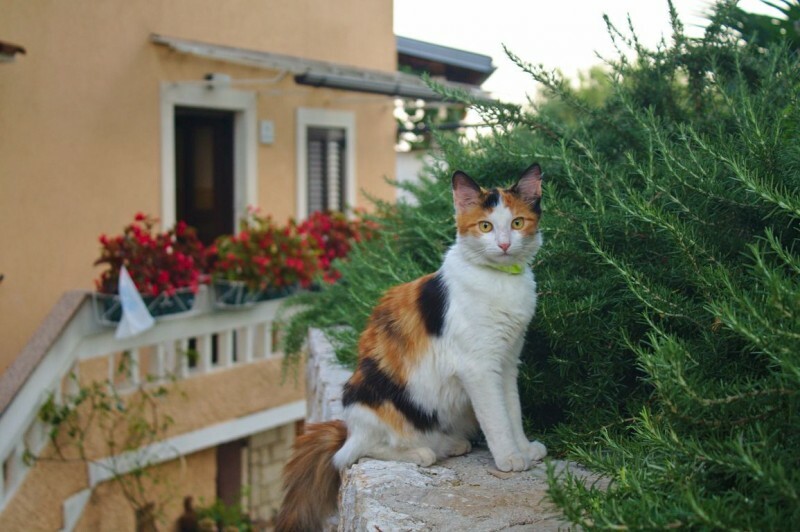 While we were searching for places along the Croatian coast for the budget backpacker, we barely found information on other travel blogs. Another challenge we had to face was the time of the year we ended up in Croatia. We already knew beforehand that August is one of the worst months to see Croatia’s coast as it belongs to the expensive summer season which starts in June and ends in the middle of September. Summer season in Croatia equals huge crowds of tourists, consisting of families on their yearly vacation, guided groups of old people and youth camps. 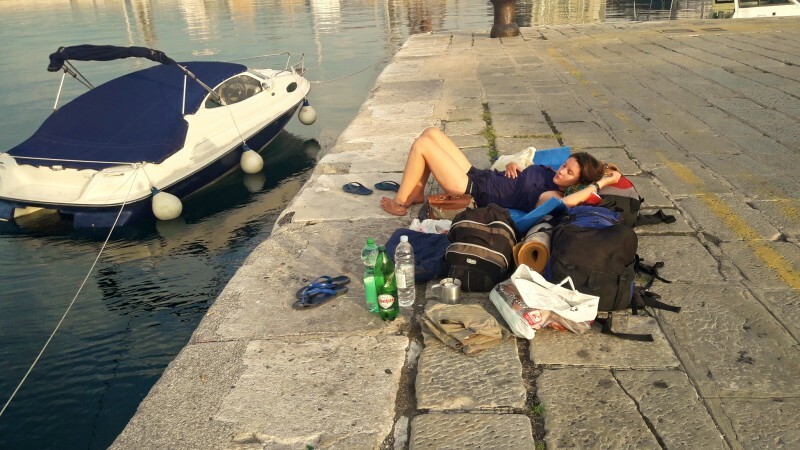 Being tackled by the worst conditions a backpacker can face, we decided to make the best out of it and to spend as less money as possible with the same wish to enjoy the Croatian summer to the fullest, avoiding tourist traps like Split or Dubrovnik. Enough introduction and personal insight views, let’s EXPLORE THE CROATIAN COAST in the most alternative and delightful way, adding names to the list of places that you probably haven’t heard of before. We like to keep our Guides as personal reports of what we saw and did. If you would like to stick to our personal route, you are free to do so. However, no pressure. You can also pick the places you’re attracted to the most and leave those out that wouldn’t fit your personal needs. Arriving in Zagreb, we were challenged by extreme heat and high humidity, which proved perfectly that August is the hottest month in Croatia. Our first steps brought us to an underground passage which was filled up with stores, bakeries, fast food restaurants and Trafikas (Croatian convenience stores). The prices for food were moderate and we could enjoy our first traditional local dish: Burek, a pastry filled with potato, cheese, spinach or meat. The only price that we thought was disproportionally high was the price for a water bottle. In euros, a 1.5 l bottle of water costs 1 euro. Pay attention where you buy your water. In bigger discounters like Plodine or Lidl, you will also find water for under 50 cents. However, these places are quite remote and tourists usually frequent the Trafikas or very small local Konzum stores. Also consider that you have to pay a deposit for the bottle which is already calculated in the final price. That means, if you return the plastic bottle, you will get your deposit of usually 50 lipa (0.50 kuna) back. 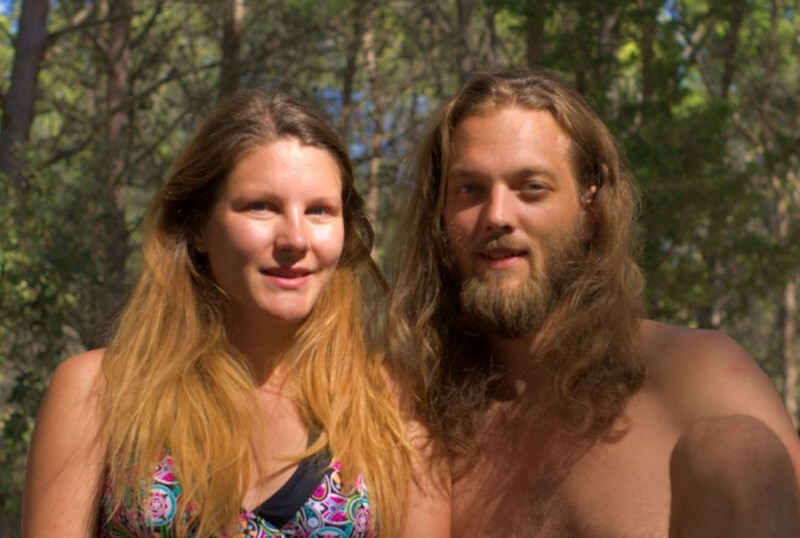 In general Wild Camping is forbidden in Croatia and also the mood accordingly on the Internet is quite negative. Nevertheless, we’re a courageous and adventurous couple that couldn’t be stopped by such warnings. As it got darker, we left the center, aiming for some quiet place to stay the night. Zagreb’s inhabitants are not very open towards wild camping and also the lack of nature in the near surroundings makes it hard to find a quiet spot to put up the tent. 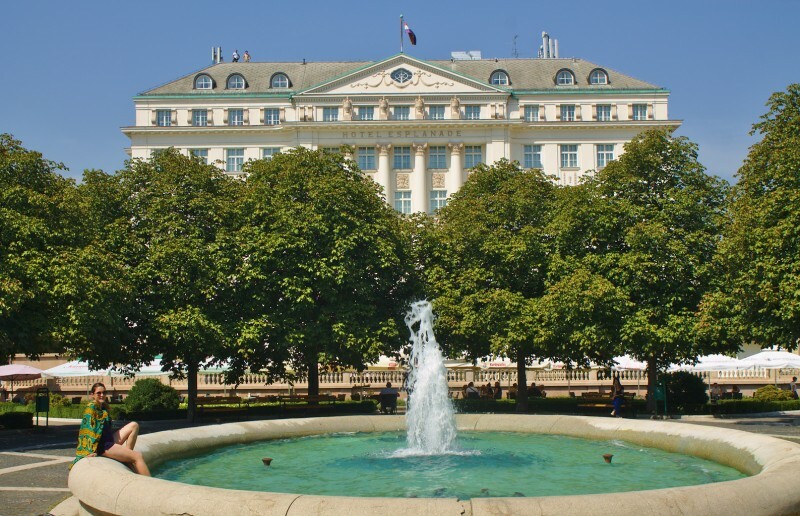 As Zagreb was only a stop-over on our direct way to the coast, we didn’t want to spend money on accommodation with prices soaring horrifically in this time of year. We read on the Internet that Park Maksimir offers some shelter for wild campers, that’s why we headed this direction. It was a long walk through nature, passing big houses and farms. The further we walked in, the more abandoned the area presented itself to us. As it got darker quickly, we managed to find a spot under some low trees which seemed bewildered. The park itself began only a few meters away from here, but was firstly too dark and secondly unsuitable to put up our tent because the ground was hard and there were no trees to shelter us from pedestrians walking by the next morning. When we woke up at sunrise, some old woman was already on her feet, plucking fruit in her garden next to our spot. When I got out of the tent, she seemed quite upset and strict about travelers like us. Luckily I spoke her language, so we could calm her down, excusing ourselves for the inconvenience. In the end, her anger vanished and she even gave us some pears for breakfast. 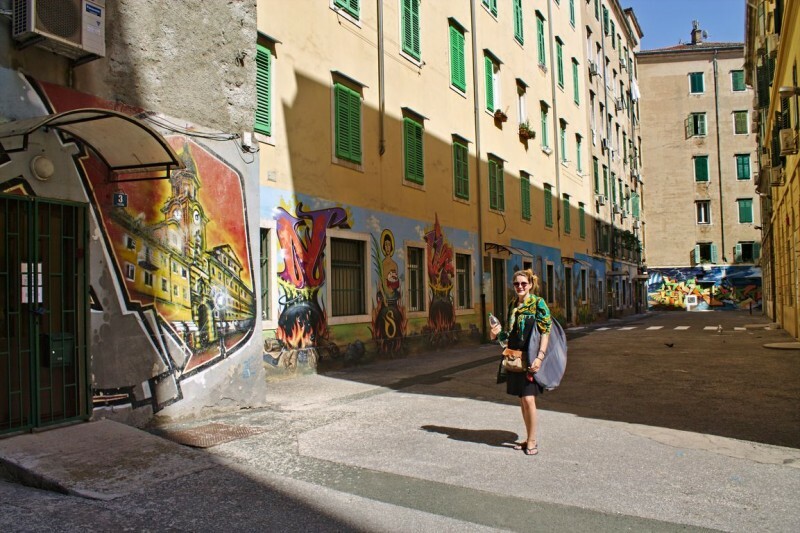 Rijeka is a city with many faces. 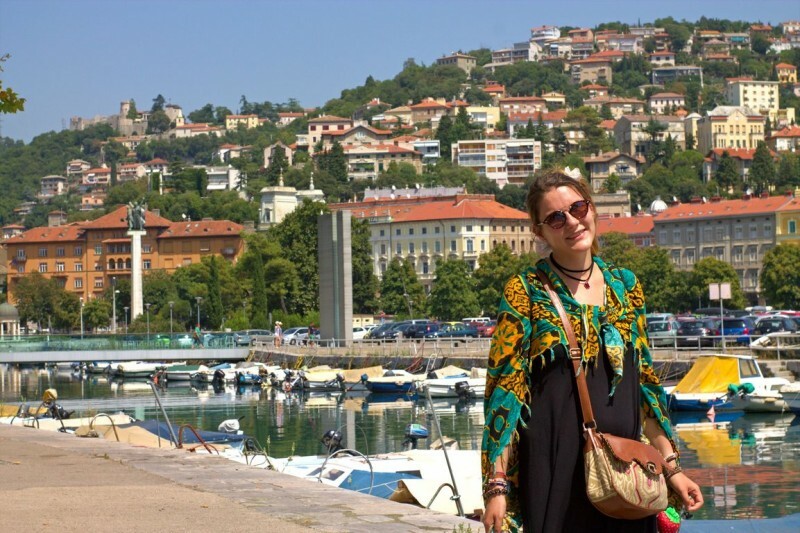 It’s a place for young Croatian students and backpackers. It hosts many cultural events and is also known for its nightlife along the port. It’s the probably most alternative hotspot of Croatia’s youth. If you just arrived and missed the last bus stopping along the beaches, feel free to rest at the port. If you’re too tired to look for a place to stay the night, there is no danger to sleep at the port. There is a parking lot which gets empty before midnight, afterwards there will be no-one to bother you. The only thing to consider are the mosquitoes in summer, so don’t forget to put socks on as they mostly aim for the feet and ankles. We experienced that the port is an uncommonly safe place to rest till sunrise. If police patrols around and sees you lying there, just excuse yourself that you are waiting for the Katamaran to the nearby islands of Krk or Cres. Usually the first of these passenger boats leave the port very early in the morning, what will make the police quickly go back to their own business. Kantrida Beach (Bus 32) is the beach closest to the city. Apart from offering less shelter to put up a tent, it’s a nice spot to stay the night by just sleeping on your mats at the beach. With free drinking water to fill up our bottles and free showers, it’s a good place to spend a few hours or even the night. Bivio Beach is also accessible by bus (Bus 1), although a little bit harder to find because there are several little paths going down to the coast. Stay in the bus till the last stop, then walk a bit West from the bus stop and you’ll find it. The beach is not clearly marked anywhere which is why it’s not very touristic here. It’s still crowded, but most people seem to be locals. The map only shows the little beach bar: Bar Empeduja. There are free showers and drinking water and we were able to spend a whole night here. We felt completely safe in our little rocky corner sleeping on mats, covering ourselves with a light blanket or long scarf because mosquito bites can be quite annoying here. 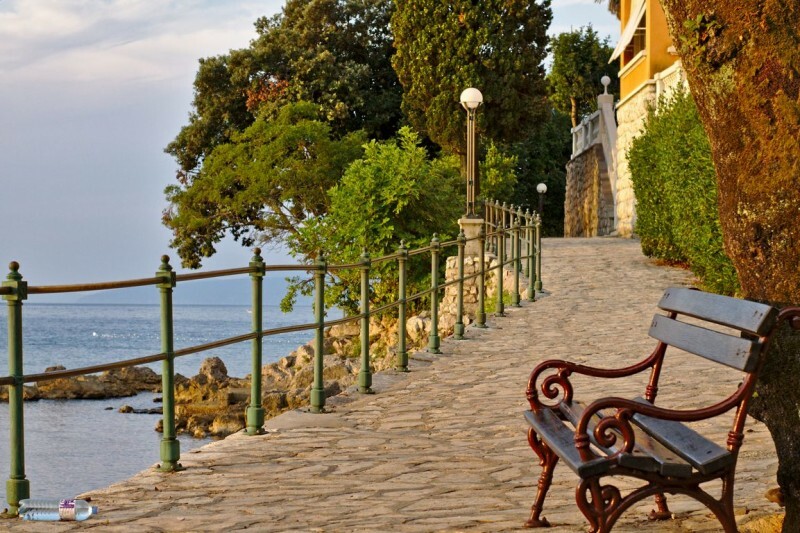 In the area around Opatija and Medveja, everything gets more expensive, more touristic and more crowded. The main beach seems to be more suited for rich tourists who are willing to pay to use a mattress or to use a shower. There’s also no drinking water, but a little Konzum supermarket across the road for refreshments. Although it seems impossible to find a place to park if you come by car, it’s about a kilometer walk from the parking lot at the smaller Medveja beach. Next to the road, there is a (relatively large) parking lot next to the road. As it’s a little walk from the town center, most people don’t park here. The small entrance to the beach is hidden next to the road, across an abandoned building on the left. There are some trees in the back of this beach providing a little shade and since it’s surrounded by rocks on the left and right side, it provides some shade if you come in the right time of day. 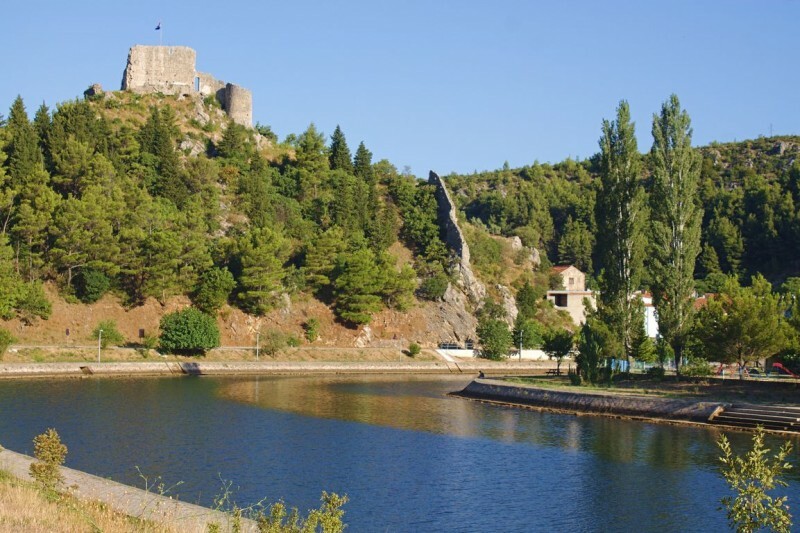 This little, sleepy medieval town turned out to be a hidden gemstone, offering a view of the opposite Cres island. Here time seems to stand still and you cannot leave this place without being enchanted by the colorful fisherman-styled houses and picturesque alleys. Crikvenica is a pretty popular beach destination among the Croatian folks itself and together with the tourists it adds up to one of the most crowded beach towns in Istria. Luckily, we were able to find a parking space in the neighbor town Dramalj, very close to the beach. We swam a bit in the sea to cool down from the heat. Unfortunately, there are again no showers or drinking water. If you prefer a peaceful spot, you won’t find it in Crikvenica but for a little stroll in the evening the town might be interesting. Once you’re on the Magistrala for a couple of days, the main highway connecting the whole Adriatic coast, you notice the urge for a change of environment. As the majority of travelers come to Croatia to travel along the coast, many places in the inland remain unexplored. 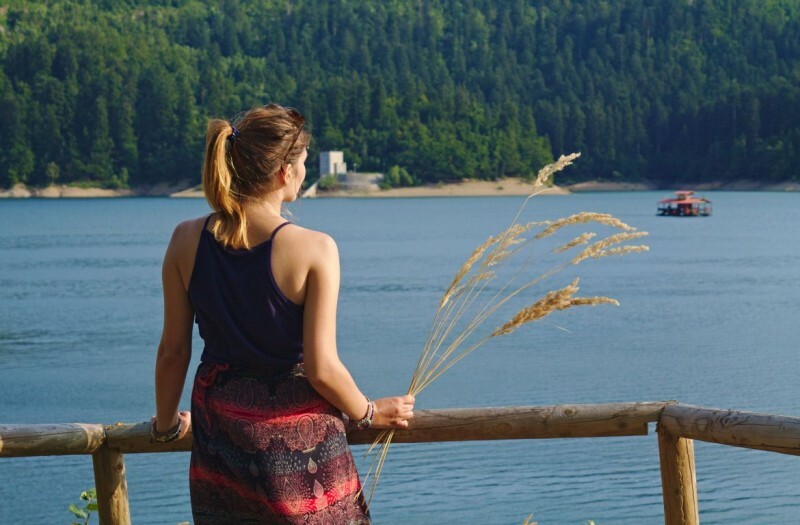 We found a lake called Omladinsko Jezero (meaning Lake of Youth in Croatian), not far away from the coast, between two tiny villages called Mrzla Vodica and Homer. Coming from the side of Mrzla Vodica, the landscape resembles the German Black Forest with traditional wooden houses decorated with flower pots on the balconies. The other side of the lake is accessible from Homer. We parked the car near a path leading down to the lake. 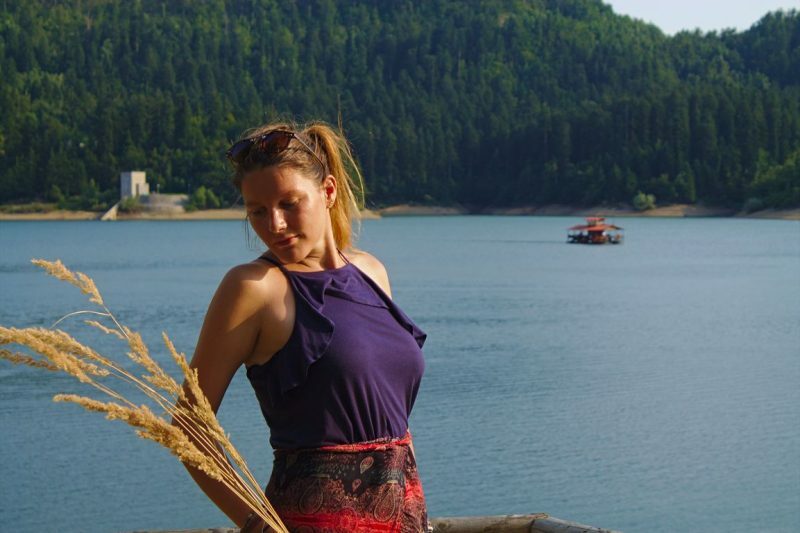 The lake is surrounded by hills with dense forest which gives the scenery a wonderful frame. The water is clear though ice cold. There were just a few people, cooling down in the water. Apart from them, it was absolutely quiet. There is a nice, little viewpoint next to the lake with some picnic tables. Senj is a bigger town and not really luring us to visit it. The only sight which might be interesting to see is a fortress on top of a hill. At the day we passed it, we were surprised by a strong and rough wind which is known here as Bura. Nevertheless, we made it up to the so-called Nehaj fortress where we caught a breathtaking view of the sea and some islands in the distance. The first thought that came to my mind when setting foot on Sveti Juraj was how peaceful and, compared to other places, how empty it is. 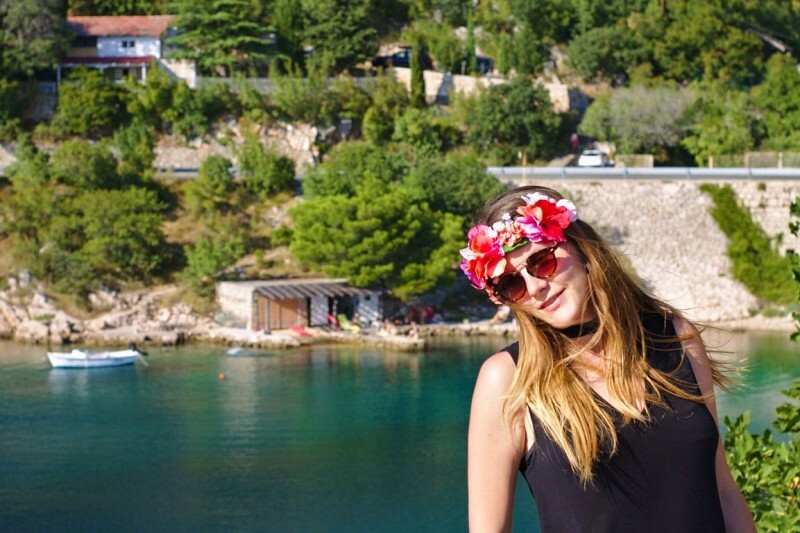 Sveti Juraj is a tranquil village and harbor, marked by rocky beaches and a bunch of little islands, so close to the mainland that you can reach them by swimming. Also pay attention to the vegetation here: cactus and sea plants make a great decoration for your photos. On the way to Starigrad we couldn’t resist to make several stops along the highway. Although it is known that Croatia has more than thousand islands, you start to believe it when you drive on the Magistrala towards Dalmatia, the South Coast. Some islands were so tiny that they didn’t look much more than a rock sticking out of the ocean. Some of these mainly uninhabited islands are more famous than others. 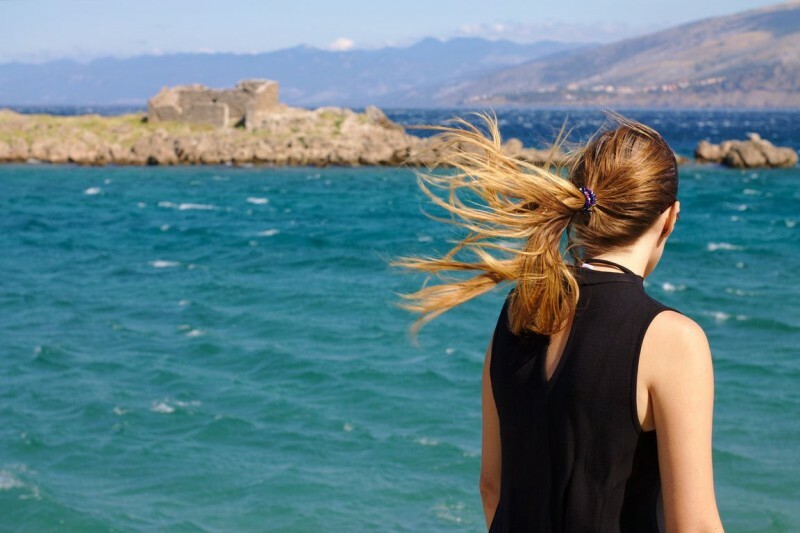 Galešnjak, for example, is one of the more well-known islands, because it has the shape of a heart and is therefore known as the Lover’s Island. After Starigrad, the Magistrala splits up – one road going East, one road going Southwest. Unless if you decide to keep driving toward Zadar, both roads end up in Benkovac. The first time, we went East. The Magistrala goes inland from here. The few buildings next to the road are all in ruins and the empty, dry road makes it look like you’re driving in the Nevada desert. That is, until the road goes down toward a little town next to a river: Obrovac. There are two big buildings in town, both abandoned. One appears to have been some apartment complex, the other, a little walk down the river, seems to have been a restaurant with a large parking lot that is slowly being taken back by nature. Unfortunately, it seems like the abandoned restaurant is currently in use as a massive public toilet. 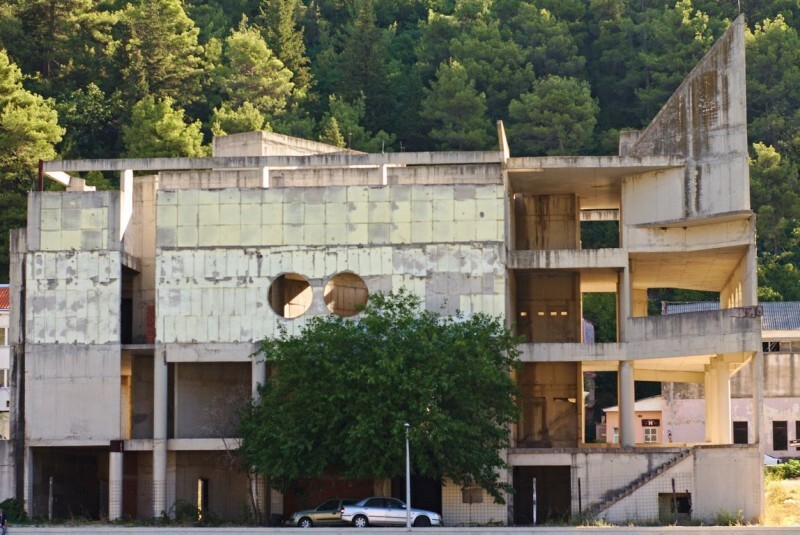 Obrovac is a remarkable place for urban exploration. Travel back in time and imagine how life used to flourish here in the past. As fans of urban exploration, we added it to our list of abandoned places. 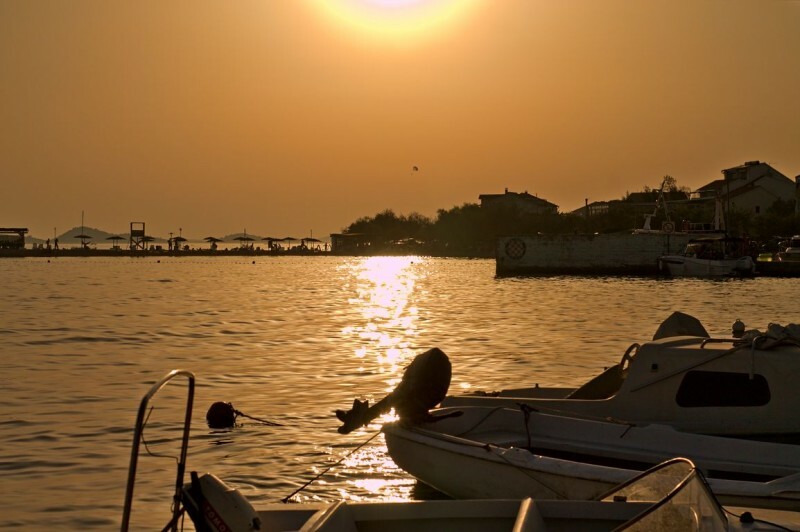 Biograd na Moru is a beach town rich in culture and domestic produce. Locally produced olive oil, wine and sweet liquor are only some few examples of what delicacies you can find here. 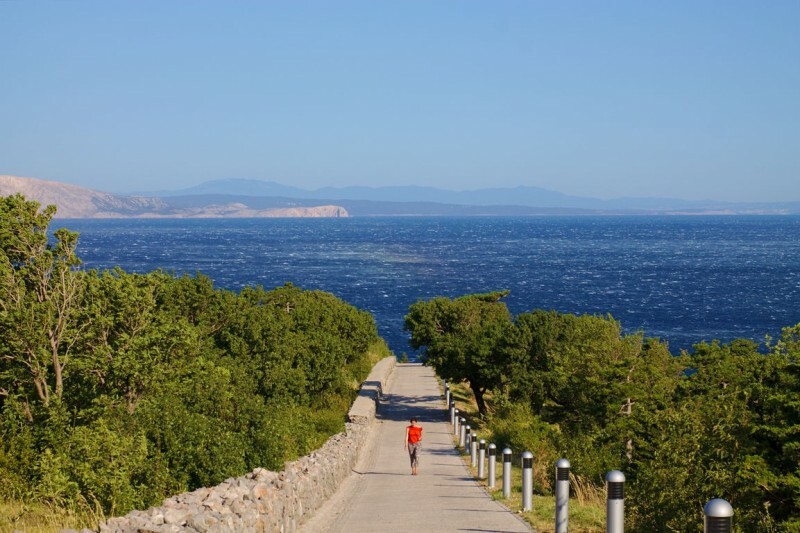 A little further from Biograd is a beach called Pine Beach, which did seem like worth visiting. You can park for free if you don’t mind a 5-minute walk or you can pay to park in the crowded lots. Most people prefer to pay, it seems, as the free parking lots had enough space. The entrance is blocked off by another camp site. They want you to pay to get on to the beach. There is free access to the beach if you simply walk around it. There are many pine trees on the beach itself, so there is plenty of space in the shade. The water and the view are really nice here and there is a little snack stall with prices that aren’t too touristic yet. Vodice is a nice, little town, but again full of tourists, making it hard to find a place to park. Srima is a little place with big resorts but they have a little beach as well. Just outside Srima, there is a bridge going toward Šibenik. Right after the bridge, there is a resting place where camper vans and bicyclists stop for the night. Here, we also stayed in the car for the night. While we were looking for a parking lot, we came across a place that will always belong to our list of mesmerizing places ever seen. An endless stairs leading down to a beach, offering an unforgettable view over the Dalmatian coast. 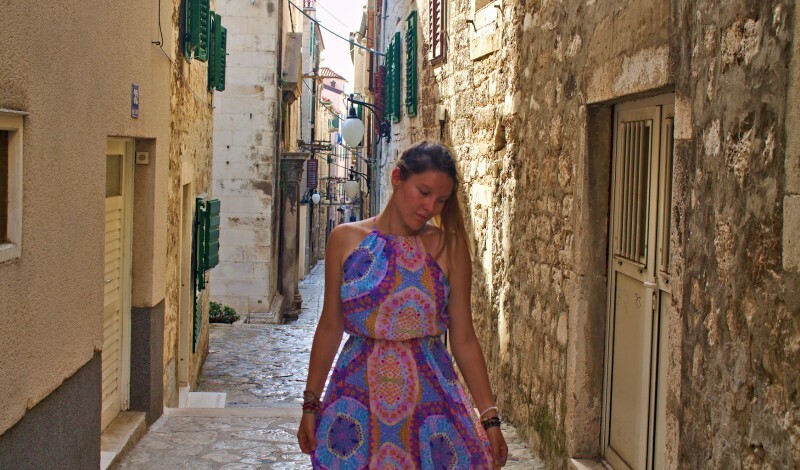 If you’re tired of being stuck in big tourist groups like in Split or Dubrovnik but are still interested in a typical Croatian seaside town, choose Šibenik. This town has an ancient city center built on wide stone stairs, with narrow alleys and secret pathways. You will find a bunch of little shops and cafés with a cathedral (Svetog Jakova) in between and an old fortress (Sv. Mihovila) not far from there. Between a café and a hostel on the main road, there are some water taps – although we were not sure if it’s drinkable – but this was a popular spot for thirsty pigeons and people enjoying a beer. After spending 5 days on the road cruising the Croatian Coast from Istria to Dalmatia, we remained totally mesmerized by its beauty. It’s not surprising that tourists storm this country in summer as there are so many wonderful places, making it easy for everyone to find its own little paradise. We saw all the mentioned places within less than a week, unfortunately way too short but for the amount of places we passed through we cannot complain. Renting a car in August, the peak of season, which proved not to be the best idea; however, if you find yourself in the same situation as us, consider to pay around 35 to 40 euros per day, including the full insurance. If you want to save money like us and don’t mind being uncomfortable for a few days, there is no problem to sleep in the car as long as you don’t do it in cities or crowded places. We truly lived a road life, sleeping in the car on abandoned parking lots or next to the road, making coffee on our camping cooker, buying food from local supermarkets and catching wifi in cafés or from open networks. Try not to rush through the places, but take your time to explore the different regions of the Croatian Coast. Croatia’s Coast left us stunned and hungry for more. We will surely return one day because Croatia revealed itself to us a little bit and we didn’t arrive at the end of this love story yet.